If you are looking for information on Advanced Fog of War, a Plus and Pro Subscription feature, please see this page. 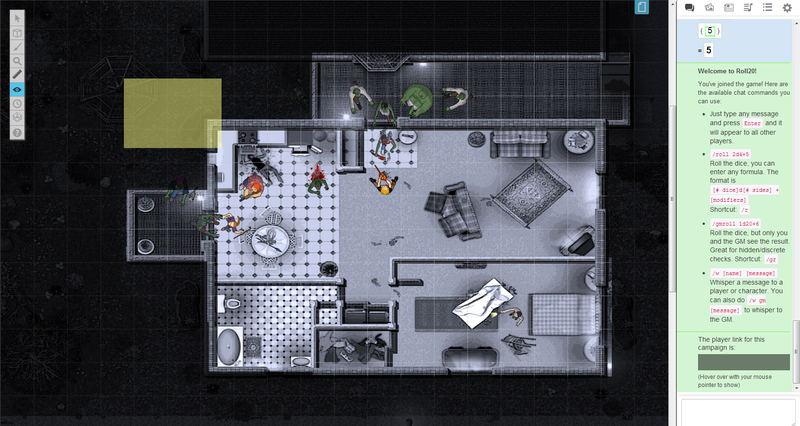 The Fog of War feature allows you to gradually reveal areas of the map to your players. This is useful if you have a party exploring a dungeon where they shouldn't be able to see the rooms and hallways that have yet to be seen. Fog of War is static and can only be removed or covered up again manually by the GM; the presence or absence of PCs, light sources, lines of sight, etc. will not roll back any Fog of War. Roll20 paid subscriber's have access to Dynamic Lighting which is an additional tool that offers a dynamic and hands-off means to track line of sight and player vision on a Page. The Fog of War will cover up anything on the tabletop, including all tokens, maps, text, and drawings. The only exception is that a player can see any token that he or she has control over. This prevents players from accidentally moving their tokens into a location beneath the fog where only the GM could recover them. Enabling Fog of War is done on a Page by Page basis via the Page Settings window. By default, a page has their Fog of War feature disabled. To enable, go to the Page Toolbar, and then click the gear icon for the page you wish to add Fog of War to. The gear icon will open that page's Page Settings window. Check the checkbox next to Fog of War: Enabled to activate the Fog of War. Click on the OK button at the bottom of the Page Settings window to save your changes. If you have the edited page currently loaded on the Tabletop, your view of the Tabletop will now appear slightly darker. This is the Fog of War added to the Page. Once enabled, the entire page will be hidden behind the Fog of War and ready for the GM to start revealing areas of the map for the players. 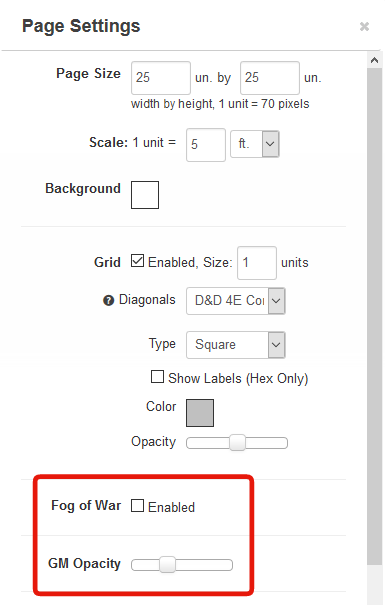 In the Page Settings window you can also adjust the GM Opacity slider. This controls how dark the Fog of War and Dynamic Lighting appears to the GM. Slide it to the right for greater opacity. At 100%, the Fog of War will be completely opaque, I.e. solid black, to the GM just as it would be for your players. If you are a PLUS or PRO subscriber, your GM Opacity slider will be listed after the Dynamic Lighting settings of the Page Settings window. Clicking on the Eye icon of the Tabletop Toolbox will pull up a submenu of Fog of War tools to reveal or hide areas of the page. When using Reveal Areas, left click and drag on the Tabletop to draw out a rectangle. You will see a yellow selection area appear under your mouse cursor as you do this. When you release the mouse button, the area you have drawn will be revealed. To reveal further parts of the page, just repeat this process. The Polygon Reveal tool functions the same way one would use the Polygon/Line Tool from the Drawing menu of the Tabletop Toolbox. Click on the Tabletop where you want the vertices of the polygon to be drawn and a yellow selection area will start taking shape. Hold down the Shift key while drawing to conform the polygon vertices to the grid. Pressing CTRL/Option + Z while drawing will undo the last vertex step you made. Either hit the Escape key, right click, or left click close to the starting point of the polygon to finish the shape. 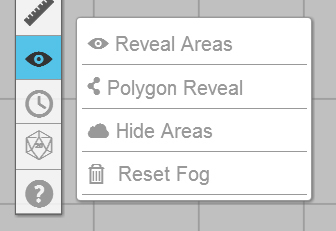 If you've made a mistake or need to cover a previously revealed area of the page with fog, choose the Hide Areas subtool. This tool operated exactly like the Reveal Areas subtool. Each rectangular area you click and drag over the Tabletop will cover that area with fog again. If you would like to cover the Tabletop completely up with Fog again, select the Reset Fog subtool. A confirmation window will appear first to ensure that this action isn't made by mistake. If you wish to see what your Fog of War masking looks like from the Player's side, go to the Settings Tab on the Sidebar and at the top of the tab, click on the Re-Join as Player button. 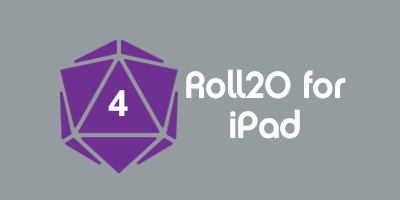 This will reload Roll20 with the Player's user interface. To jump back to GM Mode, go back to the Settings Tab and click on the Re-Join as GM button. NOTE: Make sure you've set the Players Bookmark Ribbon on the page you're currently working on or else your Tabletop might load an undesired page. This can also be achieved by going back to the Page Settings and sliding the GM Opacity to 100%, but you may find the above method faster. This page was last modified on 26 September 2017, at 15:10. This page has been accessed 145,446 times.